The Housing Chronicles Blog: Register now for 7th annual Inland Empire Economic Forecast Conference on 9/29/16! Register now for 7th annual Inland Empire Economic Forecast Conference on 9/29/16! Want to know what to expect for the Inland Empire economy now through 2035? 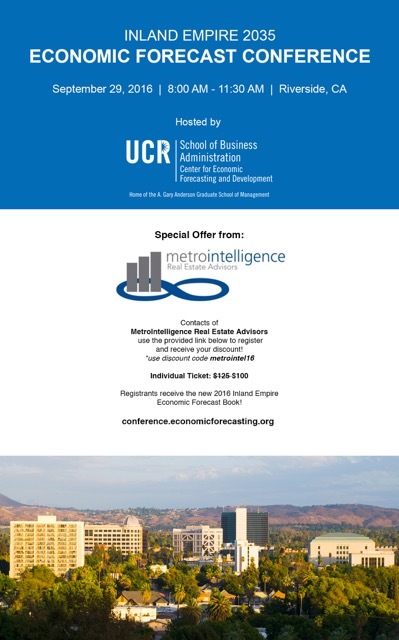 Please join MetroIntelligence, Beacon Economics and UC Riverside for the 7th annual Inland Empire Economic Forecast Conference on September 29, 2016 in Riverside. Use our special discount code to save $25 to register!